Our journey with Ahmad Daham with what we're expecting to be one of Jordan's most extreme drift builds, started back in October, where the first S13.5 Silvia has entered the country and got itself jacked up and built from scratch. It has taken a lot of effort, and time from everyone who was involved in this build, that even we didn't only stop at being there to take photos, but to even take parts to weld by ourselves, look for piping, hoses, bolts, and help out however we can to make this build possible. We had posted the first part of the build earlier with body work, chassis, suspension, and got the car on 4 wheels with an extremely wide steering angle set. After so many complications from parts delivery being delayed, to finding the parts needed, we're now headed to the most difficult part of the build. We usually don't post only pictures without writing about the car and the experience of the driving on the road, instead we aim them to our Facebook page! But today we're going to be posting something new to us, which is backgrounds! We've caught the new GT3 roaming around town a few days ago and thought we'd take a couple pictures and share them with you guys, and in high resolution for the first time too. Just click on the picture to open the high resolution version and weep. We assume this is one of the first GT3's in the region to go on the road. Enjoy! 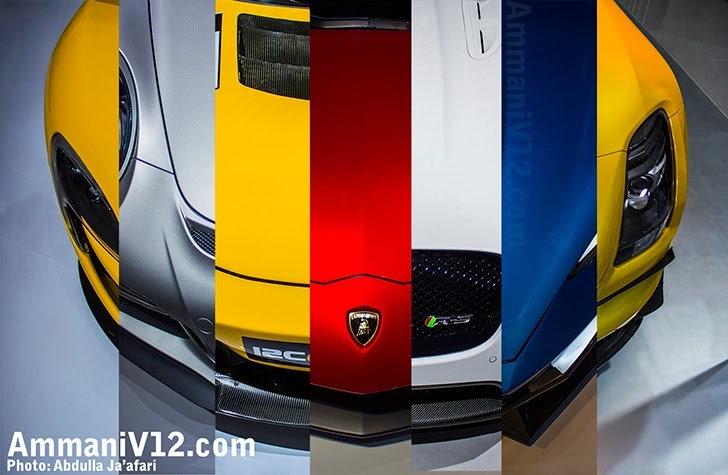 While we were at the Dubai Motorshow 2013, we've captured some of the super cool noses of some of the most exciting cars around the show. Although they were some crazy other noses, but too bad we couldn't have any privacy around some of them which made the pictures full of feet or finger prints. Here our personal collection of the ultimate 7 noses of this year's show, and make sure to let us know which of the 7 is your favorite! All copyrights of pictures and articles are reserved for the working team of AmmaniV12. Powered by Blogger.